looks just like liquid gold doesn't it? ﻿All the right ticks in place. Yeess! 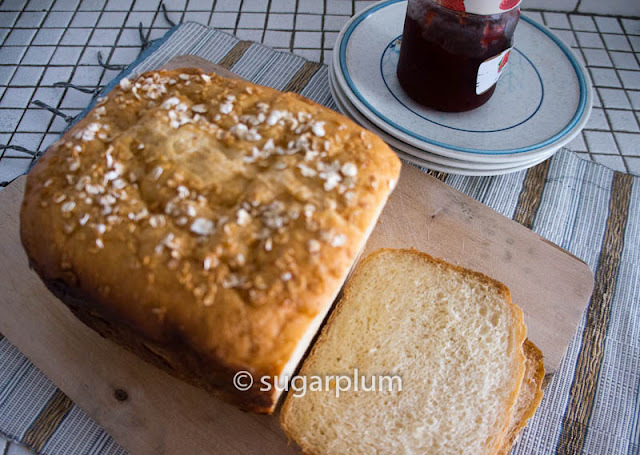 Made with oats (what can be more heart friendly than oats) and sweetened with honey (no processed sugar), this is one of the most delicious breads I’d ever baked out. Plus it’s easy on the ingredients too. The usual flour, yeast, butter, milk plus oats and honey, how complicated is that? Nutty and slightly sweet is how I would describe it. And I love how the bread looks so homemade and rustic on the outside, yet retains a soft texture. 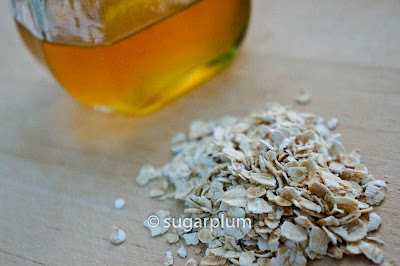 Truth be told, I try very hard to swallow my requisite spoonful of oats before breakfast – been told that it aids in lowering cholesterol levels –but it is very difficult to swallow. Ever notice that when something is good for you, it doesn’t taste very good? By adding oats to the bread dough and baking it out, you don’t even know that it’s there. Sneaky isn't it? At times when I want a richer flavoured bread, I add an egg into the mix. It can be dairy-free. I’ve tried it with soy milk and vegetable oil instead of milk and butter. And I guess vegans will need to replace the honey with something more vegan friendly like agave. However when I experimented with whole meal flour, the bread didn’t rise very much and was quite compact. When I autolysed it, for some reason the dough over-proofed and collapsed when I baked it. For whatever the reason, keeping to the basic recipe and method works best. At most, I’ve overnight proofed it before shaping and this works well too with a nice rise and good even crumb. As it is homemade, it’s best to eat it within 3 days, otherwise keep the excess in the freezer. 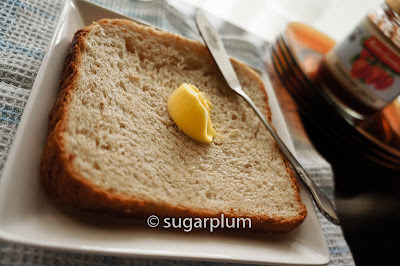 It is brilliant toasted and served it butter and more honey. Quite the bee’s knees. Yum yum. 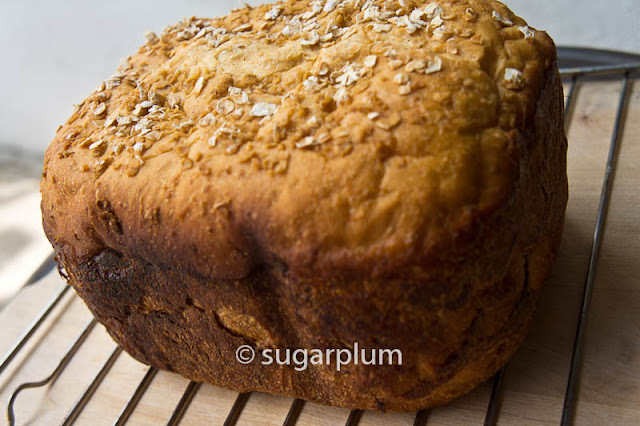 Homemade Honey Oat Bread – recipe from Darla of Bakingdom. 1. 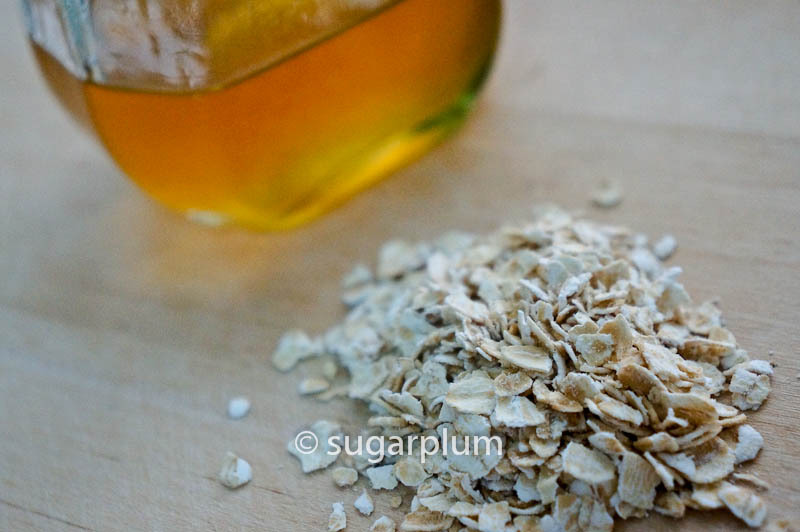 In a large bowl, or the bowl of a standing mixer, combine the flour, oats, yeast, and salt. 2. Warm the milk so that it’s hot enough to melt the butter, but not boiling. Add the butter, stirring until melted, then stir in the water and honey. If using an egg, cool the milk-honey-butter mixture before adding the egg. Otherwise you may end up with scrambled eggs! 3. 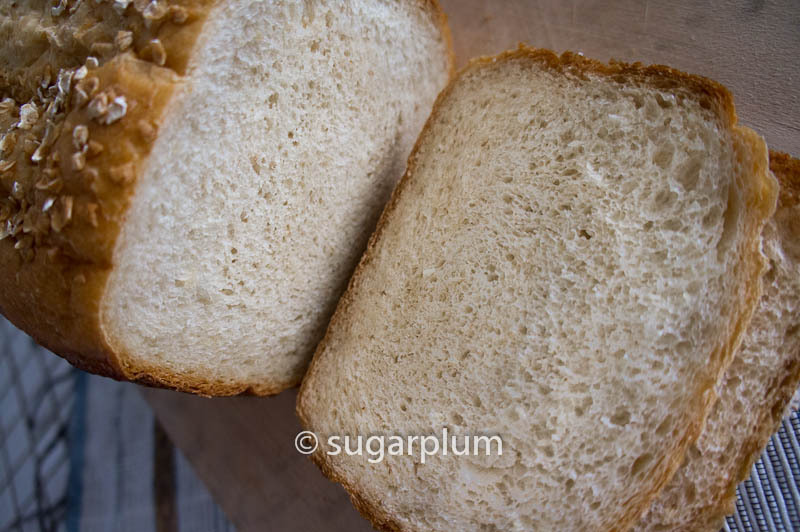 If kneading by hand, pour the milk mixture into the flour mixture, mixing until it just comes together to form a dough. Knead for 10 minutes, until the dough is smooth and elastic. If the dough is still very wet and sticky after 5 minutes of kneading, add more flour, 1 tablespoon at a time, until the dough is barely tacky. If the dough is too dry, add water, 1 teaspoon (5 ml) at a time, to soften it up. 4. 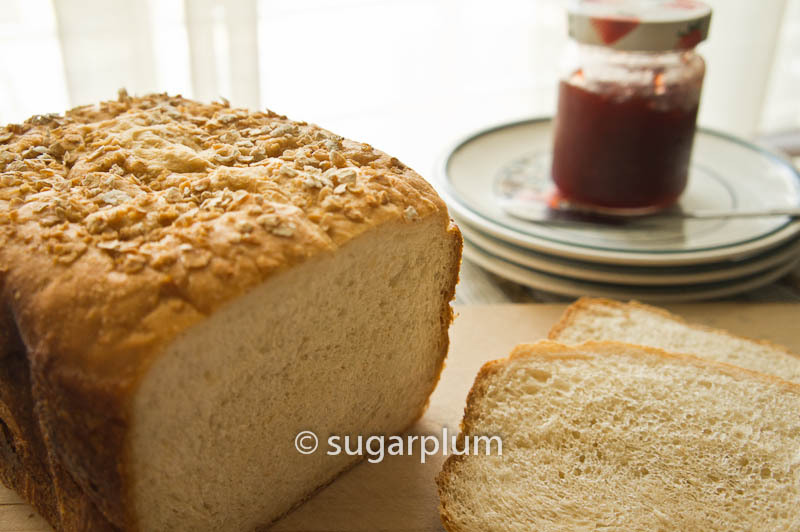 If using a bread machine, put in the liquid mix first before adding the dry ingredients. Use the dough mode to knead. 5. Once the dough is smooth and elastic, place the dough in a lightly oiled bowl, cover, and allow to rise until doubled, about 1 to 1 1/2 hours. 6. Once doubled, place the dough on a lightly floured surface. It’s time to shape the dough. 7. Gently punch the dough down and roll the dough out into a rectangle approx. 9”x12”. Roll the dough up tightly like swiss roll into a loaf. 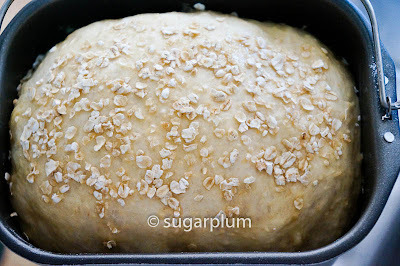 Place the shaped dough into a loaf pan, cover with a clean towel, and allow to rise until doubled, about 1 to 1 1/2 hours. 8. Preheat oven to 350 F (180 C). 9. 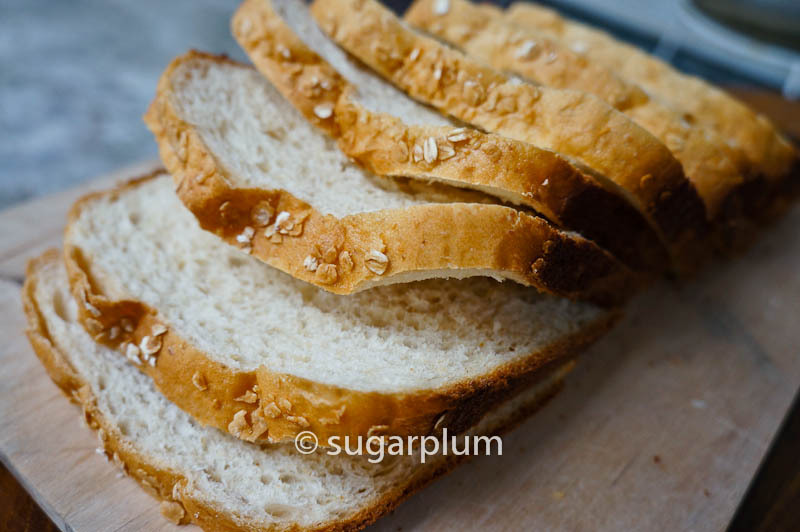 When the shaped loaf is doubled, brush the top with honey and sprinkle with the oats. Slash the top if you like. 10. Place the bread in the oven and bake for 40 to 50 minutes, until the bread is deep golden brown and the internal temperature is about 190F. 11. Transfer to a wire cooling rack and allow to cool completely before serving. Warming the milk sweetens it. 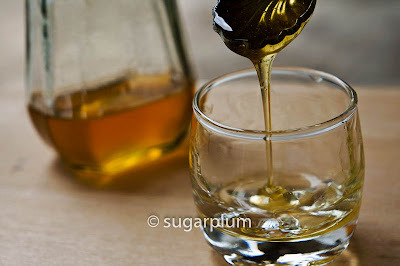 It also helps to dissolve the honey, otherwise the dough is difficult to work with. In our humid weather, I found the dough to be quite wet and sticky. I had to add more flour by the tablespoon during the kneading process. I monitored it even when using the bread machine. Hi this looks good. If I wanna do this with tang Zhong, how much do u add n do u need to sub tract anything? Hi Sheila, I actually don't know the tang zhong proportions for this recipe. To be honest, this doesn't need tangzhong as there's plenty of liquid in the recipe for a moist, soft crumb. Do give this a try and let me know what you think.